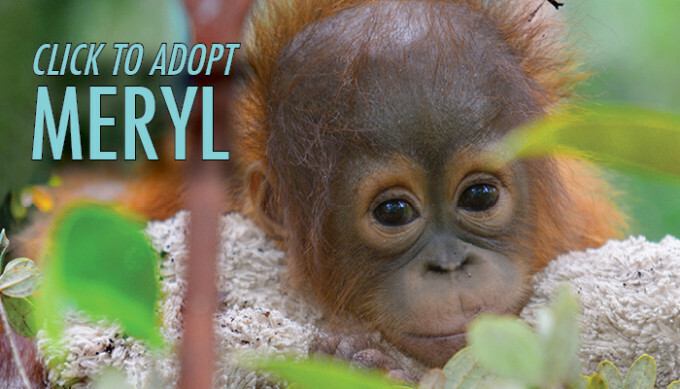 By choosing to become an adoptive parent of an orangutan you will be helping to ensure that Topan, Gatot, Molika, Krismon, Meryl, Megaloman, Jumbo, Cinta, Rickina, Gunung, Oscarina, Monti, Pingky and Neng — as well as all the other rescued orangutans being cared for by our partners IAR, BOS & SOCP — will have everything they need until they can be safely released back into the forest. 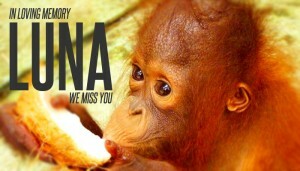 (Gracia & Her Kids are already in the wild!) 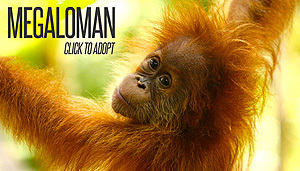 Each orangutan adoption is US $120 per year-- payable yearly or in 12 monthly installments of US $10. Payment can be made in full or in monthly installments. After you pay online you will receive an email from us with a link back to our site, where you will be able to download your adoption certificate & full color high-resolution photos. You will also find your orangutan's full history. If you do not receive the email, please check your spam box, as it may have been flagged. If it is not there, please contact us. 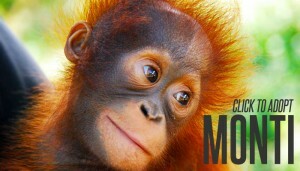 There will be updates and new photos of your orangutan(s) throughout the year. Our adoption system is now optimized for payment via Stripe. All transactions are fully encrypted in order to ensure maximum security. If you have any trouble with the payment process, please contact us. 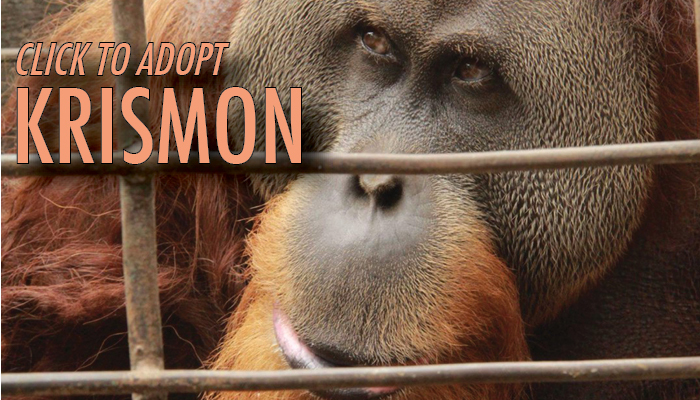 Orangutan adoptions are not a perfect science. Sometimes there are delays in the updates. The rescue centers are short-staffed and getting materials takes time. Thanks for your patience. We're all doing our best. Also, please note that the adoptions are shared among many adoptive parents around the world. Please contact us to let us know that the check will be arriving. 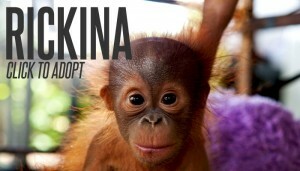 Include your full name, address and which orangutan(s) you want to adopt. Unfortunately if you do not have access to an email account you will not be able to adopt. We are making every effort to keep our orangutan adoption program as environmentally friendly as possible by conserving paper, energy and fuel at all times. Paper comes from trees. 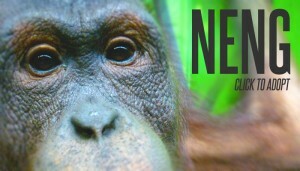 Orangutans live in trees. 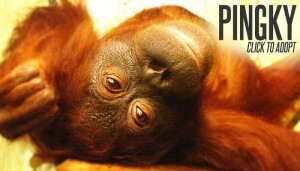 Without trees, orangutans have nowhere to live. 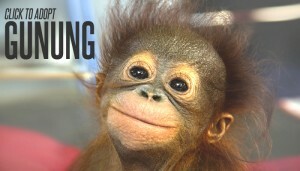 We like orangutans better than envelopes. Don't you? Finally, please note that funds collected for orangutans will be used for medicine, food, equipment, rescue operations, cage repairs and hundreds of other items that are necessary to rehabilitate the orangutans and keep the projects going. 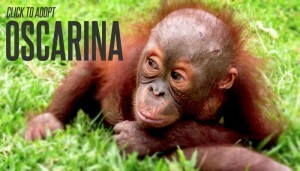 Funds will be allocated to the centers where the orangutans are being cared for. A minimal amount will be used for administrative costs in the US to continue to build up the organization so that we can rescue & care for more orangutans.